After just one visit to the Pizza DoughJo, students will master the art of making thin crust pizzas. Using her expert guidance, Pizza Sensei - Lara Pira, will help you learn how to create your own delicious pizzas from start to finish. This is one class you and your friends won't want to ditch! Summer is in full swing and what better way to celebrate than by having a Gelato party!! Join Phillipe Sobon to learn how to make different gelatos such as strawberry basil with balsamic, mocha amaretto or a mint julep. You'll be able to taste all of the delicious creations that are freshly made. We will end the night off traditionally with affogato and cannoli, as they do in Italia. 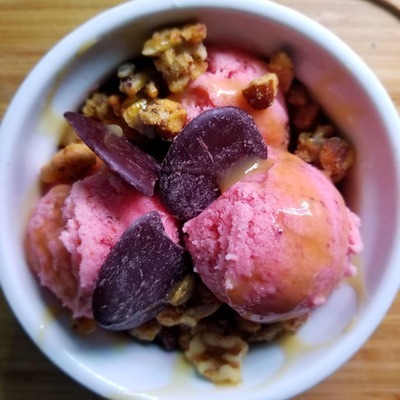 You will not only feel inspired to make gelato at home but will come away with different recipes and techniques, Did we mention it's BYOB?! Join Phillipe Sobon and learn how to make fresh pasta for your family and friends. If you're already a graduate of Pasta 101, then you'll love this course even more! Gnocchi are small dumplings that can be made with semolina, potato, sweet potato, eggs or different types of flour. In this experience, Chef Phillipe will teach you how to make traditional Gnocchi from scratch, Ricotta Gnocchi, and Gnudi. Plus we'll pair the dishes with traditional sauces served in Italian regions. Guests will have the chance at rolling out the dough and taking leftover pasta dough home! You'll enjoy a 3-course meal, demonstrated by Phillipe, along with classic seasonal sauces. Join Phillipe Sobon, a self-taught chef living in Chicago, to learn how to make fresh pasta for your family and friends. He will be teaching you how to make 3 different types of pasta from scratch, how to incorporate a healthy twist into each one, and he'll show you how to make fresh ricotta and a delicious sauce using ingredients already in the pantry. Phillipe has been a finalist on Masterchef Season 5, a contestant on Food Network's Cooks vs. Cons Season 2, appeared in USA Today, WGN, a finalist for World Food Championships 2017, and has worked with Fabio Viviani and Graham Elliot. Join Phillipe Sobon, a self-taught chef living in Chicago, to learn how to make all different types of cheese including Ricotta, Mozzarella, Burrata, and Cream Cheese. Guests will enjoy a tasting of these delicious cheeses paired with the right condiments, seasonal ingredients, and wine. Plus it's BYOB! Guests will also have a chance at making the cheese and taking it home! By the end of the class, you will walk away with a vast amount of knowledge about cheese and create a perfect cheese course at home! You will be the star of your next dinner party! Guests will enjoy a 3-course antipasto, demonstrated by Phillipe, along with classic seasonal ingredients. Phillipe has been a finalist on Masterchef Season 5, a contestant on Food Network's Cooks vs. Cons Season 2, appeared in USA Today, WGN, a finalist for World Food Championships 2017, and has worked with Fabio Viviani and Graham Elliot. As a bonus, Phillipe will be offering 50% off his private dinners and catering packages.